In my view, there is no major significant difference between legal, illegal or other immigrants (i.e., those with Visa or Green Card status) coming from out-of-state into my region. Indeed, I would be willing to endure the hard trek into the USA from a southern country if I lived in a region wherein there were drug cartels, no jobs, little food, little water, crime gangs, major poverty and so on. Yet, I look at this orientation against another that exists: The fact is, though, any community that can’t rapidly become self-sustaining towards the end of peak oil is in trouble and the more people that there are per hectare — the harder it will become, especially if soil is bad, water is scarce, weather is tumultuous or other impediments stand in the way. What happens to areas with dense human populations when fossil fuels all but disappear? Consider transportation of goods to market (especially to cities with huge populations unable to be self-sustaining); oil as the foundation for fertilizer, herbicides and pesticides; our energy supply and more.Does anyone really think that renewable energy can adequately stand in as a viable substitute, especially when refurbishment of these alternatives, such as wind turbines, is required? Besides this action relies often on an ample supply of rare minerals and metals — ones nonexistent on the gargantuan scale needed. At the same time, our current standard of living clearly is provided by our ability to burn through unimaginable amounts of fossil fuels, including an estimated 30 billion barrels of oil a year whilst roughly 40 percent of global energy consumption stems from petroleum. Conversely, people without access to such rich energy sources, whether in developed or developing nations, rightfully equate prosperity and access to material goods with fossil fuel use. Consider, too, that around a fourth or more of our crops are dependent on honey bees (on the way out). Consider overshoot stats. Consider about how much more your region can subsume people-wise whether legal or illegal immigrants, born of families that like lots of children, migration from other regions or whatever else may propel the additions. … I had a nightmare a few months ago. It was about cascading dominoes. … X population went to Y town to find food since X’s lost their homes and food supply to climate change. They quickly used up Y’s food. … Then both groups trekked to the next town and did the same action. … So the group of trekkers kept exponentially growing and was a huge mass by the time that they got to New England. Oh-oh! I live in New England. What am I supposed to do, I wondered in the dream. Am I suppose to stand with a gun and shoot some mother, who’s raiding my garden to feed herself and the baby strapped to her chest. … Yet my own family needs that food to stay alive. In “real” life, a former next door neighbor, dying of cancer, used to raid my garden. She’d go out at night with a flashlight and pick my crop. Of course, I noticed, but let it go despite that it was my labor that created the vegetables. Afterall, she was dying and I wanted her to have healthy delicious organic vegetables during her end-days. Maslow’s (1943, 1954) hierarchy of needs is a motivational theory in psychology comprising a five tier model of human needs, often depicted as hierarchical levels within a pyramid. … Maslow (1943) stated that people are motivated to achieve certain needs, and that some needs take precedence over others. The first order of business is, obviously to keep your family fed, sheltered, clothed and supplied with sufficient water. Nothing else takes precedence and in societies that do well, they can move onward to creating art, dance, music, etc., due to not having to consume all of the time just scraping by on the most fundamental level of providing for basics. My friend, long dead, discovered this being the case the hard way. An only child born of elderly parents on a Russian farm, Josh Lieberman was lonely much of his childhood. His parents noted it and gave him a lamb to raise, whose mother had died in birth. He slept with the lamb in his bed, played with it every day, fed it and tended it. What a joyous time they had together. They had bonded so well! R. J. Rummel, Professor Emeritus at the Univerisity of Hawaii, estimates the true number of deaths attributable to Joseph Stalin. He is the author of Death by Government, and his website provides the evidence in detail for what he writes here. For more information on the death toll from communism, see “The Red Plague“. He blogs regularly at Democratic Peace. By far, the consensus figure for those that Joseph Stalin murdered when he ruled the Soviet Union is 20,000,000. Josh’s Jewish parents, rather than seeing their family slaughtered, let their animals loose out of barns and pens except for ones traveling with them. Then they fled with a donkey pulling a wagon filled with vegetables, a few caged chickens, jugs of water, Josh and his best and only friend, the lamb. They traveled “off the radar” while hiding from Stalin’s forces. They mostly moved through wilderness. With no helpers in their deliberately isolated locations, eventually all of their food was gone. So they ate the donkey. Then the donkey was gone. The next day, lamb was served. Josh was not told about what he was eating. He figured it out while very hungry and with lamb still in his mouth, he promptly vomited. Then he forced himself to eat the meal as a last-ditch measure to stay alive. Indeed, he ate his friend for several days. Eventually he made it to the USA, opened up a fresh-air summer camp in Massachusetts, along with his wife Leah, for poor children, such as Jews out of Hell’s Kitchen. In other words, he and his wife managed to turn ugly circumstances into a betterment of life for disadvantaged others. They chose aiming toward societal improvement over self-centered bitterness and hatred. He also was a die-hard vegetarian. Considering that his traumatic childhood tragedy of eating his best friend always haunted him, how not? As a child, I would sit in either Josh’s or Leah’s lap and just hug the one that I had in my arms. We didn’t talk. There was no need to do so. We understood each other on a very basic central level. Dec 16, 2012 – The camp was founded in 1929 by Joshua (“Josh“) and Leah Lieberman. In 1931, Josh’s book “Creative Camping” was published. Yet, let’s go full circle here. What are we going to do with immigrants fleeing deplorable conditions in their own lands? How many more people can the world subsume with climate change conditions and fossil fuel depletion on the way? 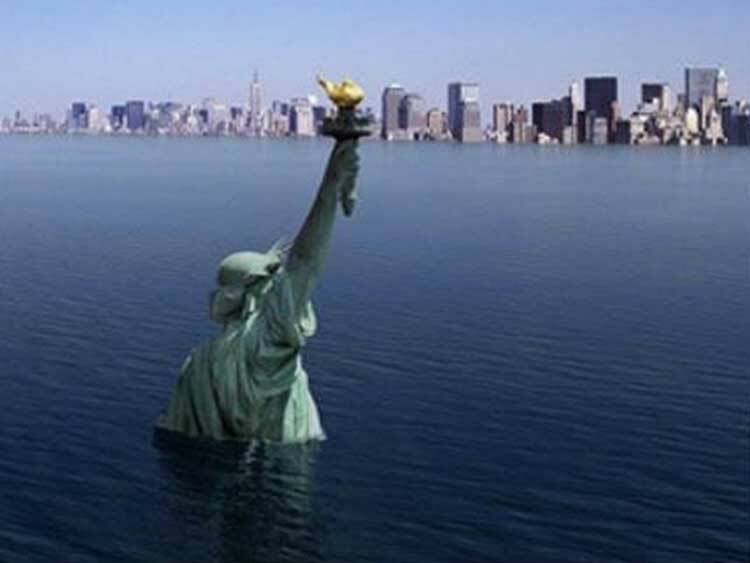 Scientists say coastal cities around the world are all but certain to face catastrophic flooding in the coming decades. Some of the details from the above link: Final data confirms record-breaking temperatures for third year in a row –Earth has not been this warm for 115,000 years | 18 Jan 2017 | 2016 was the hottest year on record, setting a new high for the third year in a row, with scientists firmly putting the blame on human activities that drive climate change. The final data for 2016 was released on Wednesday by the three key agencies — the UK Met Office and Nasa and Noaa in the US — and showed 16 of the 17 hottest years on record have been this century. Direct temperature measurements stretch back to 1880, but scientific research indicates the world was last this warm about 115,000 years ago and that the planet has not experienced such high levels of carbon dioxide in the atmosphere for 4m years. In 2016, global warming delivered scorching temperatures around the world. Even if humans stopped emitting greenhouse gases into the atmosphere tomorrow, the expansion effect would continue in the oceans for centuries, making it irreversible in our lifetimes. I just can’t assimilate the vision. I’ve already watched species diminish or disappear from my region of Massachusetts. It saddens and alarms me when I watch forest after forest cut down to build condominium unit after condominium unit. Yes, I understand. The home builders need jobs and the people need homes, but where is it to end? Where’s the limit? Where’s The Limits to Growth • Club of Rome? followed by a population bottleneck, which in turn derives something like The Road (2009) – IMDb? Should we try to correct our collective and individual trajectories now? What is the Seventh Generation Principle? May 29, 2012 – The Seventh Generation Principle is based on an ancient Iroquois philosophy that the decisions we make today should result in a sustainable world seven generations into the future. … The Great Law of Iroquois Confederacy formed the political, ceremonial, and social fabric of the Five Nation Confederacy (later Six). There are no easy answers. However, we have to be like Josh and Leah, who always tried to uplift life and not just their own lives regardless of whatever came their way. What viable other alternative is there for any of us? Thought – provoking write-up ..! When he will realise that man is the cause of his own annihilation? Some one should come up ..Like ‘ Christ second coming’ ..